The government is appealing against an order to release cabinet discussions from the aftermath of the 1989 Hillsborough stadium disaster. Then Prime Minister Margaret Thatcher held meetings about the tragedy, in which 96 Liverpool fans died. Information commissioner Christopher Graham has ruled that the information is in the public interest. 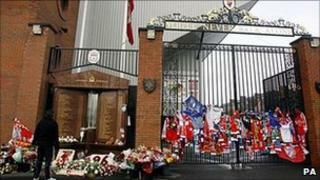 The Cabinet Office said any information must be released in line with the Hillsborough independent inquiry. Mr Graham's judgement related to a Freedom of Information request from the BBC which was refused by the Cabinet Office in 2009. A Cabinet Office spokesperson said: "The government's view is that it is in the public interest for the process that is under way through the Hillsborough Independent Panel be allowed to take its course. "The terms of reference for that process includes the intention to disclose information to the Hillsborough families first." The spokesman added: "The Cabinet Office absolutely agrees with the principle of providing information to families about the Hillsborough stadium disaster, but we believe it is important that any release of information should be managed through the panel's processes and in line with their terms of reference. "The Cabinet Office is fully committed to the disclosure process in line with the terms of reference and is working with the panel to achieve that. "The panel have had access to all the information covered by this decision notice." The withheld files include reports presented to Mrs Thatcher and correspondence between her office and the then Home Secretary Douglas Hurd and minutes of meetings she attended. Mr Graham also criticised the Cabinet Office for "unjustified and excessive delays" in handling the BBC request. The request had been followed by an internal review which upheld the refusal. Paul Nuttall, North West Euro MP for UKIP, said: "This is a cover-up of a cover-up. "What are the Tories frightened of? The people of Liverpool will be disgusted by these cowardly moves to hide the truth. "Revealing the facts on Hillsborough is hardly a matter of national security, it is a matter of natural justice." "The briefings in question are the private memos that were sent to the then Prime Minister Margaret Thatcher. "Without them being made public we will never get to the bottom of that appalling tragedy when 96 Liverpool fans including close personal friends of mine lost their lives." Ninety-five Liverpool supporters were killed in a crush of fans at the Hillsborough stadium in Sheffield, where the club was playing an FA Cup semi-final against Nottingham Forest. The 96th victim was left in a coma for three years and died in 1992.